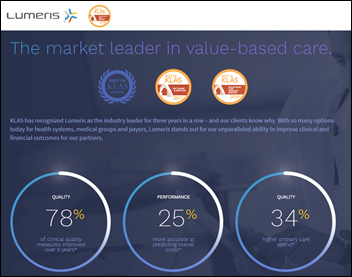 Cerner will partner with value-based care services operator Lumeris to create a combined VBC technology product to be called Maestro Advantage. Lumeris will also adopt Cerner’s HealtheIntent platform. Cerner will make a $266 million investment Lumeris, acquiring a minority share. From You Dubbed: “Re: UW Medicine’s EHR project. You shouldn’t have included the link from your reader since other sites used it without listing HIStalk as a source.” That happens quite a bit when I run insider-reported news that competing sites have to pretend they discovered on their own even though the source is obvious due to timing and the link (or lack of a link). I don’t mind that they do it, but I do mind that they intentionally don’t give credit, which I would unfailingly do. The most head-scratching commentary was added by the 2017 journalism graduate of Becker’s, who ill-advisedly went off script in pondering to a stated CIO audience, “UW Medicine has not revealed whether it will build its own system or select an EHR vendor for the $180 million effort,” missing the obvious points that (a) no health system has built an EHR in many years; (b) the project budget clearly indicates the line item involved with buying the unnamed vendor’s product; and (c) the rollout will start in a few months. From Blank Cheque: “Re: HIT family tree. Looking for the graphic depiction you ran.” The most recent version I have of the thoroughly researched and incredibly complex document that was created by Constantine Davides (now a managing director at investor relations firm Westwicke Partners) is from 2015. From which I shall extract this trivia question: what was the former high-flying point-of-care patient safety technology vendor that Cerner acquired for just $11 million in 2005? You might also want to consult Vince Ciotti’s HIS-tory, which I believe had similar depictions. 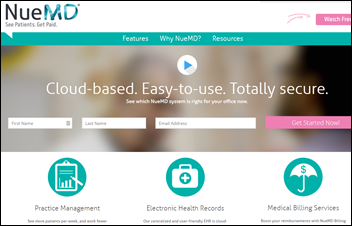 Medical practice technology vendor AdvancedMD acquires competitor NueMD, which offers practice management and billing applications that include clearinghouse capabilities. Verity Health System (CA) is looking for a buyer of some or all of its six hospitals, hoping to “address challenges our hospitals face after a decade of deferred maintenance, poor payor contracts, and increasing costs.” Patrick Soon-Shiong’s NantWorks bought a majority interest in the health system last July from its hedge fund owner, which retained a minority share and provided additional funding. That announcement touted the health system’s access to new technologies such as the ones NantWorks sells. Shortly after the announcement, Verity moved to implement Sunrise from Allscripts, of which Soon-Shiong was also an investor, a move so embarrassingly self-serving that the Allscripts sales announcement declined to refer to Verity by name. Population health management technology vendor Arcadia opens a Pittsburgh office, where it will add 30 software engineering jobs by the end of the year. Catholic Health Initiatives chooses CTG to implement Epic in its Chattanooga, TN region. Non-profit Manifest MedEx adds two large California medical groups and Stanford Health Care to its network that provides real-time patient encounter notification and a display of aggregated patient data. CEO Claudia Williams and Chief of Staff Erica Galvez previously worked for ONC on interoperability. Avera Health (SD) will implement PeriGen’s PeriWatch labor analysis software in its birthing units and will add the full PeriGen suite that includes its fetal monitoring solution. Nova Scotia Health Authority chooses Corepoint’s integration engine for province-wide interoperability for its One Person One Record initiative. Ingenious Med hires Nimesh Shah (McKesson) as CEO. He replaces Joe Marabito, who was hired for the CEO job in September 2016. State of Alaska hospitals can view view prescription drug monitoring program information at the point of care via Collective Medical’s network and platform, which also allows providers to identify their highest-need patients in real time and collaborate to meet their needs. 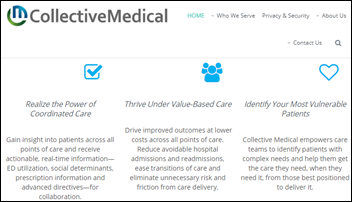 Collective’s system is endorsed as a best practice for emergency medicine by ACEP, whose state chapter was involved in the rollout. KLAS introduces high-mindshare precision medicine vendors in a new report that will be followed in Q4 by a more detailed version that will include customer opinions. 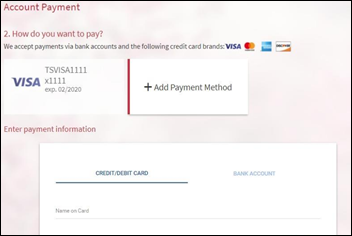 InstaMed makes its External Payment Page Integration available in Epic’s App Orchard, allowing sites to create a seamless, secure online payment experience without requiring them to store credit card and bank payment information. In England, Secretary of State for Health and Social Care Jeremy Hunt replaces the resigned Boris Johnson as foreign secretary. Taking over Hunt’s job in a flurry of Brexit-related resignations is culture secretary Matt Hancock, a 39-year-old former economist and technologist. The White House eliminates most of the remaining CMS funding for navigators who help people sign up for Affordable Care Act policies, also requiring groups who apply for navigator grants to pitch short-term and association health plans that offer cheaper but less comprehensive coverage, charge sicker people higher premiums, and exclude pre-existing conditions. Drug users are monitoring their post-ingestion heart rates on their fitness trackers and posting screen shots on Reddit and other sites to show the effects of what they took. A quantified selfer reports, “Drugs are the only reason I wear a Fitbit. I want an early warning system for when my heart’s going to explode.” Experts warn that this is a really bad idea given the inaccuracy of the devices and maybe for taking potentially deadly drugs in the first place. 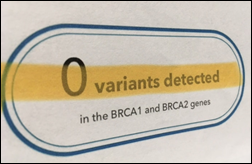 A woman with a family history of cancer celebrates her 23andMe BRCA1/2 breast cancer genetic test results that showed no variants, only to receive hospital results four weeks later indicating that the company’s less-than-thorough testing missed the fact that she’s genetically at risk. 23andMe’s fine print indicates that it tests only the most common genetic variants. The woman will have her breasts and ovaries removed this month to reduce her 70 percent chance of getting cancer. Solutionreach adds the voice of three patient advocates to its company blog. Datica joins the Cloud Native Computing Foundation. CRN recognizes Burwood Group’s Joanna Robinson as one of its 2018 Women of the Channel. CenTrak expands IoT location and sensing services to Awarepoint customers. d) Build its own system for $180 million would be a pretty sweet deal. They can turn around and license it for billions. I think UW should go with that option, much more economical. Art_Vandelay is correct with Bridge Medical. I hadn’t seen the acquisition amount shared publicly before. This is a very thorough genealogy. 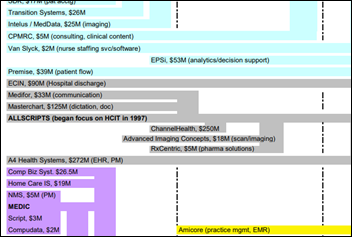 Nimesh Shah (aka NIMROD) was the hired wrecking ball for the EHR business at MCK. Best of luck to you guys getting him now,………….